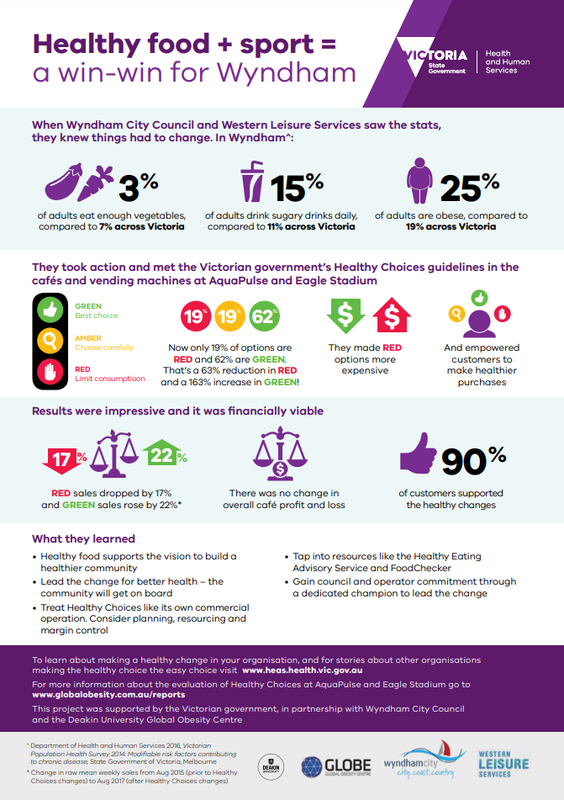 Since opening in 2015, Western Leisure Services has progressively implemented the Healthy Choices guidelines in its community leisure facilities, Eagle Stadium and AquaPulse. Both facilities are now compliant with Healthy Choices requirements, as they provide at least 50% GREEN (Best choice) foods and drinks, and no more than 20% RED (Limit) items. As a result of their efforts, sales of RED cold drinks have fallen by approximately 65% at both venues, while sales of GREEN and AMBER (Choose carefully) foods and drinks have increased slightly. Profit and loss data showed no clear change over time at either venue. Customer surveys support the changes, as a large majority of respondents support healthy food and drink initiatives in sports and recreation centres, and agreed that these venues have a responsibility to promote and support healthy eating. vision and support from people in leadership positions. Click here to learn more about Wydnham's 'Healthy food + sport' initiative (PDF - opens in a new window).